Hat left at crime scene. Vandals who struck a golf course in eastern Iowa over the weekend left behind some items that could lead to their arrest. The vandalism at the Knoll Ridge Golf Course in North English was discovered around 5:30 Sunday morning. The perpetrators entered sheds, took golf carts and damaged most of the greens. Several of the golf carts were then dumped into ponds on the course. Some items left behind at the scene are suspected of belonging to one or more of the vandals. 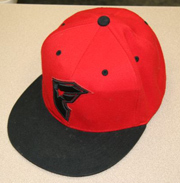 The items include a black and red “Famous” brand flexfit ball cap and a “Fox” brand backpack. 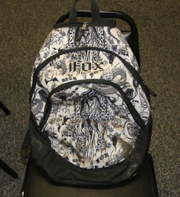 Anyone with information about the possible owners of the cap and backpack is asked to contact the Iowa County Sheriff’s Office at 319-642-7307. Bag left at crime scene.